According to the reports, 172 people have died in the state due to heavy rain and floods. 20 people have lost their lives today. The Chief Minister had informed earlier that the recuse operations would be speeding up today. But the army had started the air lifting operation by 10 am only. 5000 policemen were deployed for rescue operations today. Super Prime Time in discussion with K N Balagopal, A A Shukur, Tony Chammany. J Padmakumar, Adv. Harish Vasudevan. #MalayalamNews #MalayalamLatestNews #KeralaNews Connect with Mathrubhumi News: Visit Mathrubhumi News's Website: Find Mathrubhumi News on Facebook: ----------------------------------------------------- Mathrubhumi News (മലയാളം: മാതൃഭൂമി ന്യൂസ്) is a 24-hour Malayalam television news channel and is one of Kerala's most viewed TV channels. Owing to its varied presentation style and reliable content, Mathrubhumi News has become the fastest growing news channel in Kerala. More than just a news channel, Mathrubhumi News features a host of programmes that relate to various aspects of life in Kerala. 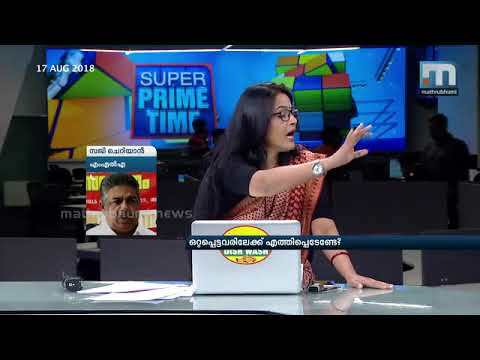 Some of the frontline shows of the channel include: Super Prime Time, the No.1 prime time show in Kerala, the woman-centric news programme She News and Nalla Vartha a news program that focuses on positive news. Mathrubhumi News is an initiative by The Mathrubhumi Printing & Publishing Co. Ltd. Mathrubhumi News. All rights reserved ©.